This visitor's guide to the Big Sur region of California's central coast contains information on driving, lodging, camping, restaurants, scenic vistas, and other activities, facilities, and services available in the area. I have tried to emphasize in these pages information that would be most important and useful for visitors to have in hand well before arrival in the Big Sur region. 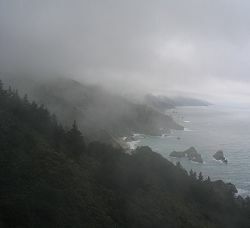 In the Along the Highway pages of this guide, I have described each major location you will encounter along this scenic Big Sur segment of California Highway 1 and have included extensive information about how to find these locations as you drive Highway 1. I have provided links to the other sections of this guide and to selected relevant sites elsewhere on the Web. 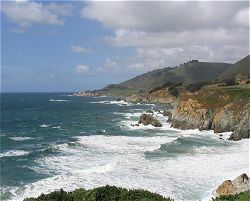 The Activities, Facilities, and Services section of this guide groups each type of activity, facility, and service together, showing where in the Big Sur region each is available, with links to the Along the Highway pages of the guide. 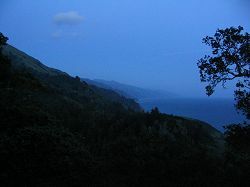 The list includes visitor services in Big Sur such as lodging accommodations, camping, restaurants, picnic areas, ranger stations, and gift shops; "views" such as scenic vistas, wildlife viewing, and waterfalls; activities such as hiking and backpacking, highway and trail bicycling, fishing, and hot springs; and places of historical interest and spiritual emphasis. Please feel free to contact me if you find that information in these pages is out of date or erroneous, and I will make the necessary corrections. Thanks!